Home | Introduction | Contacts | Our Vehicles | Photo Galleries | Guestbook | Links | For Sale | Calendar . "A group of like-minded enthusiasts dedicated to keeping historic military vehicles alive"
The Medway Military Vehicle Group (The Awkward Squad) was formed in 1986 by a group of Landrover enthusiasts who by coincidence had bought military versions. The group has evolved over the years to cover any British post war military vehicle. 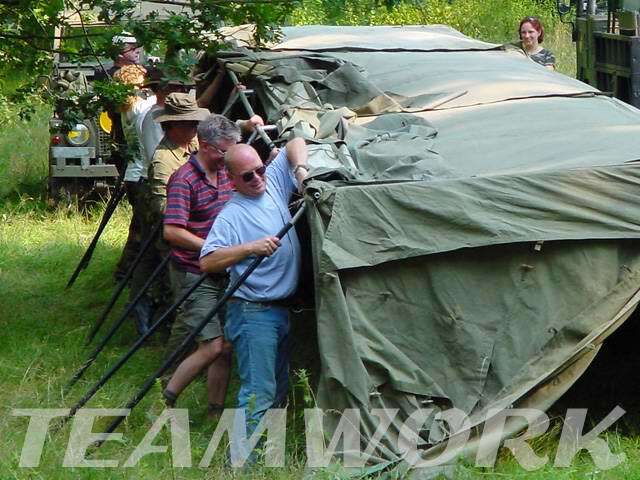 We attend several shows during the year, including an annual visit to Belgium, and the group always puts on a large display of equipment, tents, communication and floodlight masts and camouflage netting. Most vehicles and trailers are fitted with the appropriate equipment, radios and even de-activated weapons. If you own a British post war military vehicle, have a worrying fixation with camouflage netting and aerials, enjoy a beer or two and don't take life too seriously, we are always on the lookout for new members. There is no membership fee but you will occasionally be asked to contribute toward purchase and upkeep of group owned equipment. Sorry - We don't allow civvy tents or caravans. We will allow "dismounted members" who don't own their own vehicles, providing they are prepared to muck in and help out. We don't want any sad bastards who won't pull their weight, simply get pissed, and insult our friends - ok?